The NEW Daily Decision for 8.6.18 - Goldilocks Looks To Be Alive And Well | Marketfy or install Google Chrome Frame to experience this site. The headlines blared that the July's Jobs Report was a "miss." This was due to the fact that, according to the Labor Department, the economy created 157,000 new jobs last month, which was below the consensus estimate of 190,000. As such, the bears gasped loudly and proclaimed that the economy must be rolling over. However, after digging into the report, my response to the nattering nabobs of negativism is, "Uh, not exactly." First off, we need to recognize that the monthly job totals are almost always revised the following month (you know, when the actual numbers are in). For example, June's new job creation total was revised upward to 248K from 218K while May's total moved up by 24K. This means that the economy actually created 59,000 more jobs than were originally reported in the prior two months alone. So, the optimist in me says that if you add 59K to 157K you get 216K new jobs, which would have been a "beat." Oh, and the average job creation total over the last 3 months currently stands at 224K. Not bad for an economy that is supposed to be running out of workers. The Unemployment Rate fell to 3.9%, although why the Labor Department doesn't break that number out a few more decimal places in this day and age is beyond me. For the month, average hourly earnings rose by 7 cents, or 0.3%. On a year-over-year comparison basis, wages rose by 2.7%. Insert second gasp here, because this is above the critical 2% level that everyone is watching. So, inflation has GOT to rise soon, right? Counterpoint number one, courtesy of J.P. Morgan's David Kelly, is that from a macro point of view, wages are not keeping up with the current pace of inflation. JPM's Chief Global Strategist told us Friday that although wages are up 2.7% over the past 12 months, inflation itself is up 2.8%. So, Kelly contends, there is no need to panic about runaway inflation just yet. Kelly also pointed out that corporate profits are up 27% over the past year. This argues that wages are not impacting Corporate America's profits as companies have been able to effectively keep a lid wage increases. So, again, there really aren't any big inflation issues here. From my seat, it appears this was yet another economic report that can be placed in the Goldilocks category. And in turn, this "splains" why the stock market rallied on Friday - despite the "miss" on the Jobs report. 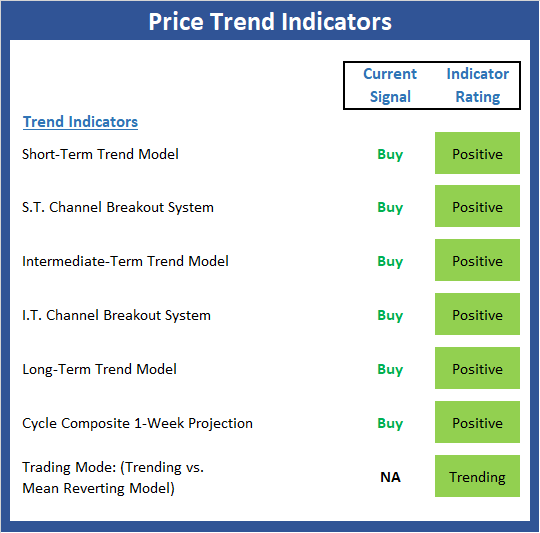 However, with some weakness still present in my favorite market models (see the Primary Cycle Indicators board below) and overhead resistance looming on the S&P 500, it will be interesting to see if the bulls have the muscle to break on through to the other side in the near-term. 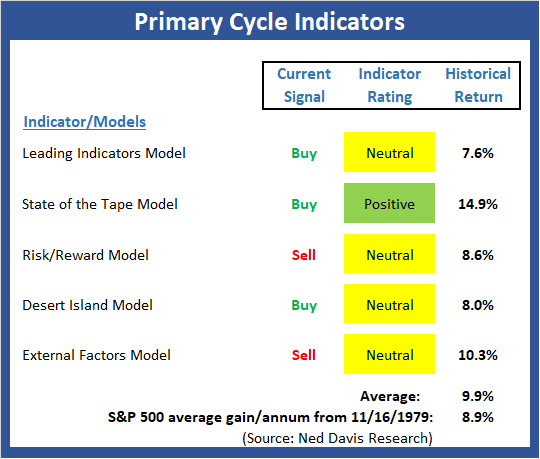 The Primary Cycle board stabilized this week with no changes to any readings. But with two of my favorite longer-term, big-picture market models still on sell signals, I reserve the right to remain a bit cautious. The Trend Board continues with an impressive amount of green this week and as the saying goes, "the trend is your friend." 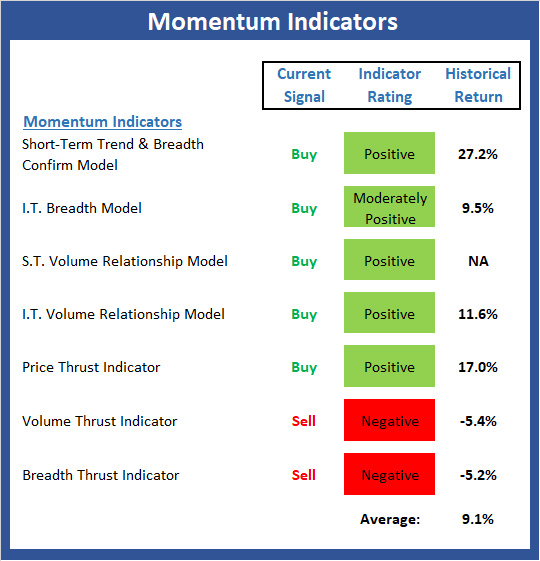 The momentum improved last week and is in pretty good shape. But there is still some red on the board, which will be something to watch this week. 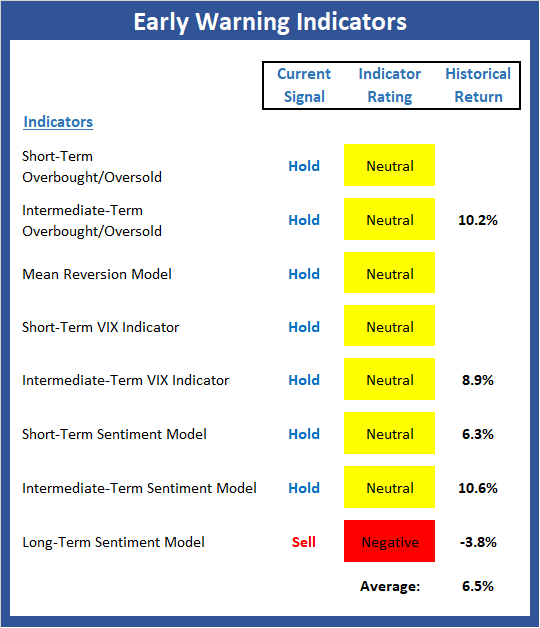 The "Early Warning" board did a good job waving the yellow flag prior to the recent weakness and has now turned neutral almost across the board. This tells me to favor the current trend. 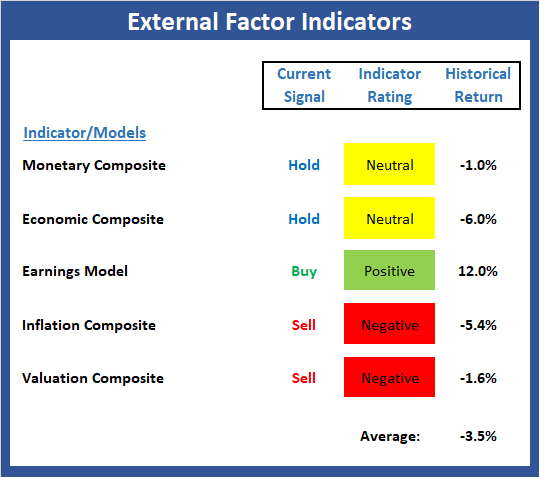 The internal components of the External Factors board improved modestly again last week, but not enough to change any of the signals. And while I hate to sound like a broken record, the fact that the historical return of the market for the current model readings still negative means I will continue to support some caution here. Publishing Note: My next report will be published on Wednesday morning.